The increased prevalence of traumatic injuries and strokes has laid the ground for the immense rise of the global intracranial pressure monitors market. The upswing in the cases of brain injuries in children as well as adults has also boosted the demand for intracranial pressure monitoring remarkably across the world. However, the biggest influence on this market, which stood at US$0.94 bn in 2014, has been accredited to the substantial shift from invasive pressure monitors to non-invasive pressure monitors. This trend is expected to have an enduring effect on the dynamics of demand and supply of these monitors. Transparency Market Research expects this market to rise at a CAGR of 6.30% between 2015 and 2023, with business opportunity reaching US$1.63 bn by the end of 2023. Untapped developing countries are anticipated to present opportunity-rich market for participants in the global market for intracranial pressure monitors. A significant growth can be witnessed in the demand for intracranial pressure monitors with their increasing application in the detection and management of various cerebrovascular disorders such as meningitis, traumatic brain injury, brain tumor, and intracerebral hemorrhage. In 2013, the traumatic brain injury segment accounted for the biggest share in the demand for intracranial pressure monitors. TMR projects this segment to rise at a rapid CAGR of 7.70% between 2015 and 2023. The increase in violence, rising industrial as well as road accidents, and rising number of reports related to head injuries due to sports and recreational activities are the prime reasons behind the growing prevalence of traumatic brain injuries. The market for intracranial pressure monitors stretches across North America, Europe, Asia Pacific, and the Rest of the World. North America has surfaced as the biggest contributor to the intracranial monitor consumption since the past few years. The increasing prevalence of neurological disorders and traumatic injuries have amplified the application of these monitors in this region. Additionally, technical advancements in the field of pressure monitoring are expected to influence the sales volume of these monitors considerably in North America over the coming years. Although North America will remain the leading regional market for intracranial pressure monitors during the forecast period, Asia Pacific will offer the most profitable opportunities to market players, on account of the presence of a large number of untapped markets. Apart from this, the augmenting incidence of cerebrovascular disorders, fuelled by the increasing base of geriatric population, and the rising expenditure on healthcare, owing to surging disposable income, are also projected to boost the demand for these monitors in the near future. Europe holds the second position in the worldwide intracranial pressure monitors market. Integra LifeSciences Corp., Medtronic Inc., and Codman & Shurtleff Inc. are leading the global intracranial pressure monitors market. The collective share of these three companies in the overall market is 53.4%. Other prominent manufacturers of intracranial pressure monitors are Haiying Medical, HeadSense Medical Inc., Raumedic AG, Spiegelberg GmbH & Co. KG., and SOPHYSA. Intracranial pressure monitors are used in a wide range of applications in the treating brain trauma. This report on intracranial pressure monitors analyses the current and future prospects of the market. The report comprises an elaborate executive summary, including a market snapshot that provides overall information of various segments and sub-segments. This section also provides the overall information and data analysis of the intracranial pressure monitors market with respect to the leading market segments based on type, application, end-user and geography. Some of the factors that are driving the global intracranial pressure monitors market are technological developments related to intracranial pressure monitors, increasing number of medical device companies conducting research and development studies across the globe, presence of large geriatric population, and rising incidence of traumatic brain injuries due to traffic and industrial accidents. The market overview section of the report includes qualitative analysis of the overall intracranial pressure monitors market including the factors determining the market dynamics such as drivers, restraints and opportunities, along with Porter’s Five Forces Analysis. In addition, various analyses such as market attractiveness analysis by geography and competitive landscape by key players have also been provided. The market attractiveness analysis explains the intensity of competition in the market in different geographies. The competitive scenario between different market players is evaluated through market share analysis. These factors would help the market players to take strategic decisions in order to strengthen their positions and increase their shares in the global market. The intracranial pressure monitors market has been segmented based on product type, end-user, and geography. Based on product type, the intracranial pressure monitors market has been categorized into external ventricular drainage system, lumbar drainage system, microtransducer ICP monitoring devices, and non-invasive ICP monitoring system. 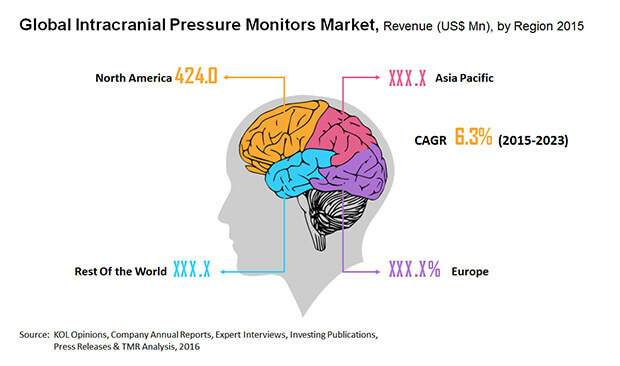 Traumatic brain injury, intracerebral hemorrhage, meningitis, subarachnoid hemorrhage, and others form the major applications of the intracranial pressure monitors market. Market revenue in terms of US$ Mn for the period 2013-2023 along with the compound annual growth rate (CAGR %) from 2015 to 2023 is provided for all the segments, considering 2014 as the base year. Geographically, the intracranial pressure monitors market has been categorized into four regions: North America, Europe, Asia Pacific, and Rest of the World (RoW). The recommendations section included in the report would assist existing players to increase their market shares and new companies to establish their presence in the intracranial pressure monitors market. The report also profiles major players in the market based on various attributes such as company overview, financial overview, business strategies, product portfolio, and recent developments. Major players profiled in this report include CAS Medical Systems, Inc., Codman & Shurtleff, Inc., Haiying Medical, HeadSense Medical, Inc., Integra LifeSciences Corporation, Medtronic plc, Raumedic AG, SOPHYSA, and Spiegelberg GmbH & Co. KG.